When Frankie was born, I was obsessed with tracking every bowel movement, wee, breast feed, mood and so on. I was addicted to Sprout – my favourite baby tracking app (after trialling about six hundred and fifty-nine of them) – and would be on it recording information, like every hour. Obviously, everything I tracked was pretty much useless and I never looked back on it, but as a first time mum, of course I was going to track every little fart, burp, and pooh! And being a total data nerd, I LOVED the tracking. All this info on Frankie! Patterns to look for, conclusions to draw! Nerd nirvana! Our little stool of Nerd Nirvana outside Frankie’s room. And now, one month after leaving Masada, we still use this method of tracking. It’s bloody awesome. It reminds me how long we need to keep Frankie up for, it lets me know how settled or unsettled Frankie has been during a day or during the whole week. It lets me see progress we have made since “graduating” from Masada. 1. When I get Frankie out of bed after her nighttime sleep or a nap, I write the time, and “up”. Or just “U” if I am feeling particularly lazy. 2. When I feed Frankie, I write BF (breast feed) and the time. 3. When I put Frankie down to sleep, I write the time and “down” or “D”. 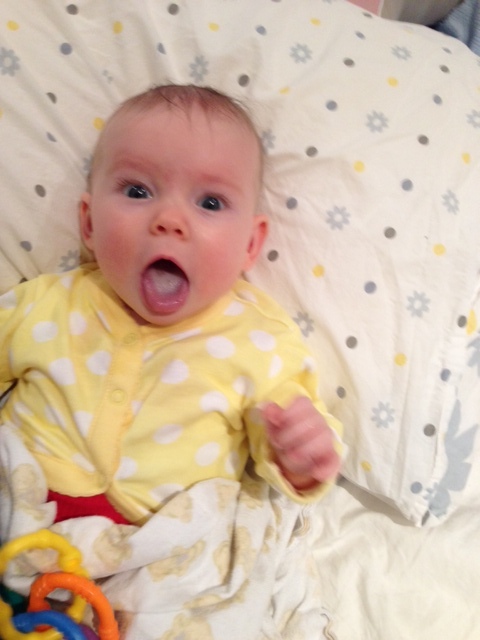 If she grizzles or cries when I leave the room, I write “grizzle/cry on exit” – or GOE/COE for short. 4. When I hear a grizzle or cry during sleep time, I time how long it goes for and write this down – for example, 2.30pm, grizzle for 4 minutes. Self-settled (if, indeed, she does self-settle). 5. If I need to go into resettle – that is, if she cries for 2 minutes or grizzles for 10 minutes, I write the time I did this and “Pat Pat”. 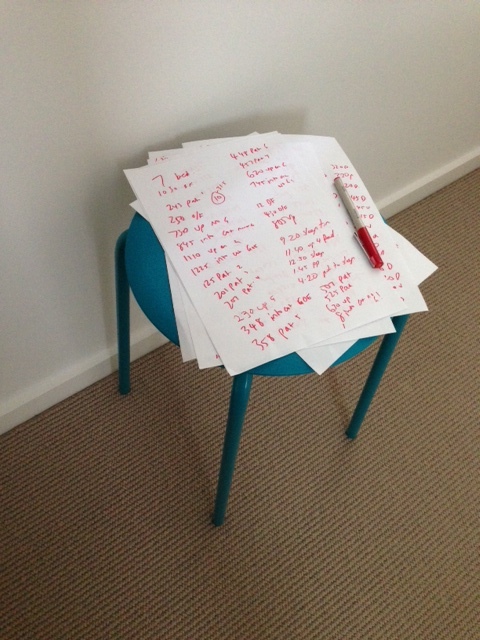 What this then leads to is a really comprehensive and useful record of how Frankie is tracking. 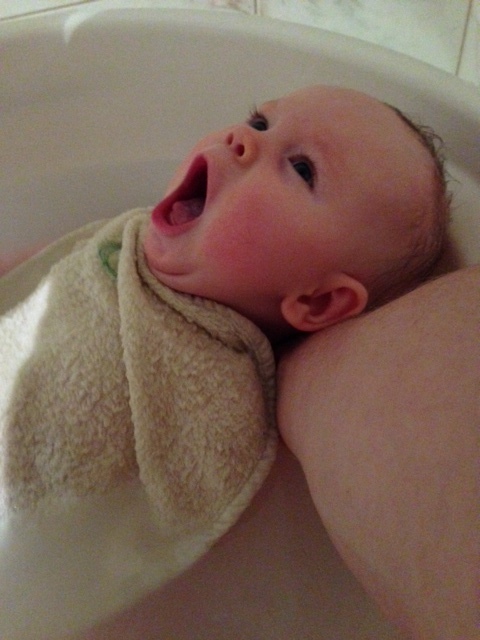 Sleepy Frankie at bath time. It also means that if my husband has been at work all day and asks “What have you been up to all day”, I can pull out the tracking sheet and show him everything that’s been going on in the world of Frankie and I.
I’d love to hear if you are tracking your bub, and for those who do try this method – what do you think of it? I remember a couple of months before Frankie was born, I was invited to speak at a “women in business” conference put on by CommBank. 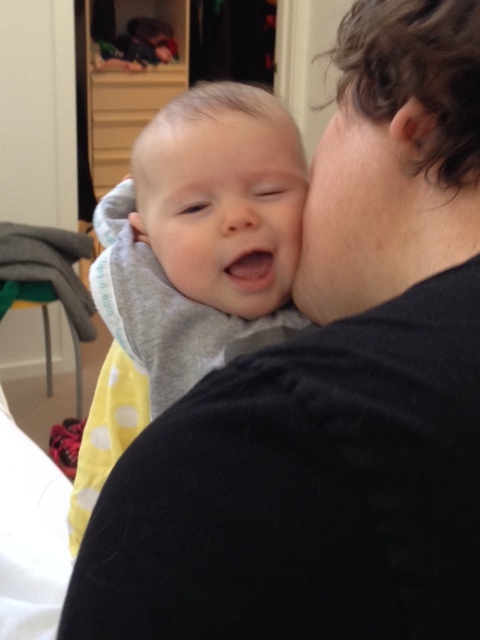 Over lunch, I got talking to this amazingly successful mum who had barely taken any maternity leave, and simply worked from home in the early weeks with her bub strapped to her chest. She somehow managed to keep her sanity and get enough sleep to run her business and look after bub. Crazy! I asked her what her secret was (because clearly she had one). She said to me: you must read “Save Our Sleep”. So upon my return home from the conference, I bought Save Our Sleep and read it from cover to cover in about a day. I remember raving to my husband, “Don’t worry, we won’t be one of those sleep deprived couples – we will simply put Frankie on this amazing routine and she will be no trouble at all!” Little did I know that EVERY SINGLE medical professional that we met in the first week of Frankie’s birth said do NOT put her on a routine. She is too young. So out went my dream of sleeping through the night. As a consequence, when Frankie entered the world, we resisted any kind of routine. We fed on demand, Frankie slept when she felt like it (at very random times during the day and night), and Frankie decided that she would never sleep for more than 3 hours at a time overnight – and even that was rare. One of the things I loved most about my Masada experience was getting a routine. Super helpful when I was planning on starting to work from home in the fortnight following. There have been a lot of comments and questions on this blog about routines, so I thought I’d take you through what Masada recommends, and what a 24 hour period in Frankie’s life now looks like. 1. Feed, play, sleep (FPS) underpins Masada’s theory about routines. I wrote about the FPS routine here and here if you’d like to know more. 2. 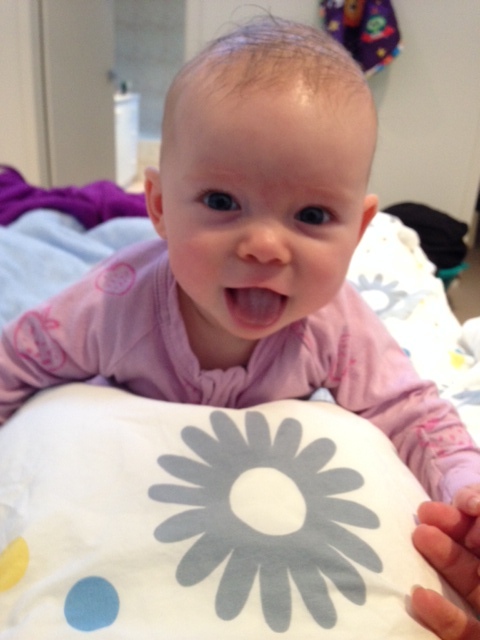 For Frankie, being three months, her recommended wake time (which includes a feed, then a play) is 1.25-1.5 hours. When she hits four months, this can increase to two hours. She is also supposed to have three naps – the first two should ideally be at least two hours, but not more than three hours. 3. Being in the 3-6 month category, Frankie should feed between 5-6 times per day. For Frankie, because she has not yet doubled her birth weight, six feeds is recommended, with the sixth one being the “overnight” feed (between 3-5am). So with those general rules in mind, here is A Day in the Life of Frankie Rose Dolan. 7am: Frankie wakes up. And if she doesn’t – we are able to wake her. Frankie does like a bit of a sleep in like her father, so there have been occasions where I have had to waltz into her room at 8am to get her day started. As soon as she wakes, I’ll do a nappy change and start feeding. Masada recommends starting the feed within 15 minutes of waking, so we adhere to that. I mentioned that Frankie is a bit of a runt and we are desperately trying to fatten her up so I will normally spend about 40 minutes breast feeding her. (FYI – Masada says that the milk bar should only remain open for up to 45 minutes after wake time begins to teach bub that milk does not flow on tap). After feeding, we play. 8.30am-10.30/11am. Frankie sleeps. This nap is meant to be the most important one of the day. If Frankie wakes before the two hour mark, we simply resettle her (using the Pat Pat, as explained here), until she goes back to sleep, or has spent a full two hours in bed. 12.30pm: Second nap of the day. 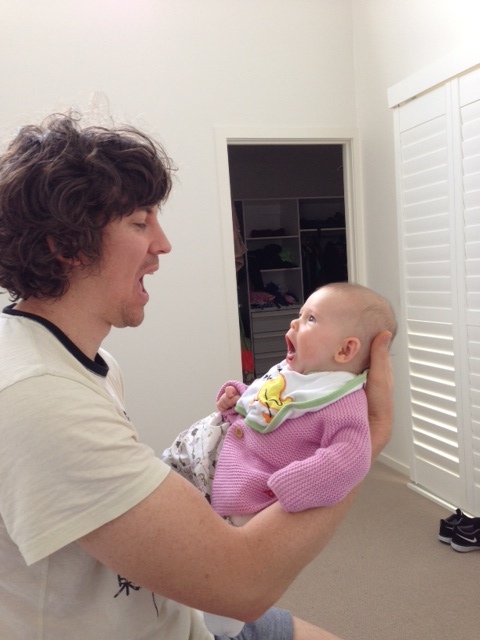 Playtime with Dad: The “who can open their mouth wider” competition. 4pm: Third nap of the day – and the shortest one. We try to get her to do a couple of sleep cycles – so about 90 minutes. 5.30/5.45pm: Wind down. If you have been following this blog, you may remember that this is the only “wake” time where the Feed and Play order is reversed. So upon waking, Frankie has a bath, then some low key playtime, and then we finish up with a feed so she goes to bed on a full stomach. Frankie being smothered in a goodnight kiss. 10.30pm-midnight: We do the dream feed within this window – somewhat dependent on when my husband goes to sleep as he is the one that gets her out of bed for this. We keep the room light to a minimum, and only change her nappy if it is busting out with pooh. 3-5am: Overnight feed. We do this on demand – in that whenever Frankie starts grizzling in this time frame, we do another low key feed (same rules at the dream feed about lights and nappy changing). And then, rinse and repeat! It’s been one week since leaving the safe bubble of Masada, so I thought it was a good time to reflect on how things have been going at home with Frankie. In a nutshell, it has been 90% awesome, and 10% un-awesome. The 90% awesomeness comes from the fact that Frankie is now down for 3 naps every day (and two of those naps are 2+ hours) and has self-settled into every single one herself (no patting required). Same goes for her night time sleeps. This is a big change from pre-Masada, whereby Frankie liked to keep us guessing as to whether she would self settle or whether we would have to bring out the big guns (in our case, the electric swing). Awesome. And on average, post-Masada, we have only had to use the Pat Pat to help her resettle between sleep cycles about two or three times in any 24 hour period – so not much at all. Yesterday was an un-awesome day. I think Frankie sensed something was in the air. Her loving, doting father has been away since Wednesday as he received some bad news about his own dad, and flew to Adelaide to be with him during the week. He gets home tonight (hooray! ), but I think yesterday the exhaustion of looking after Frankie without the help of my wonderful husband finally got to me, along with the toll the week has taken on everyone emotionally. And so Frankie was very unsettled. I had to do the Pat Pat a total of 10 times – a record for the last two weeks – and it felt like she was throwing up half of every feed (not cool Frankie – you need all the milk you can get). Today, so far, has been back to awesome. It’s coming up to 2pm and only one Pat Pat required. But my point for writing this post is that sleep school, and the weeks proceeding it, are hard work. Masada “warn” people about this, but I think that the “one step backwards” can still be really disconcerting and confusing, especially when it’s 2am and your baby is crying and you are pat pat patting and the crying continues. And you feel like curling up in a ball and crying yourself. Frankie, back in fine form today. All of my Masada “group” have been keeping in touch via Facebook. We all write to each other many, many times every day and keep each other updated on what’s happening. And on the whole, it seems we are all having similar experiences – definite improvements, some really great fist-pumping days, and some really tough times too. So if you are thinking of going to sleep school, or even if you have been reading this blog and “playing along at home”, please don’t expect the ride to be smooth sailing. The seas are choppy, but I just know it will be worth it in the end.